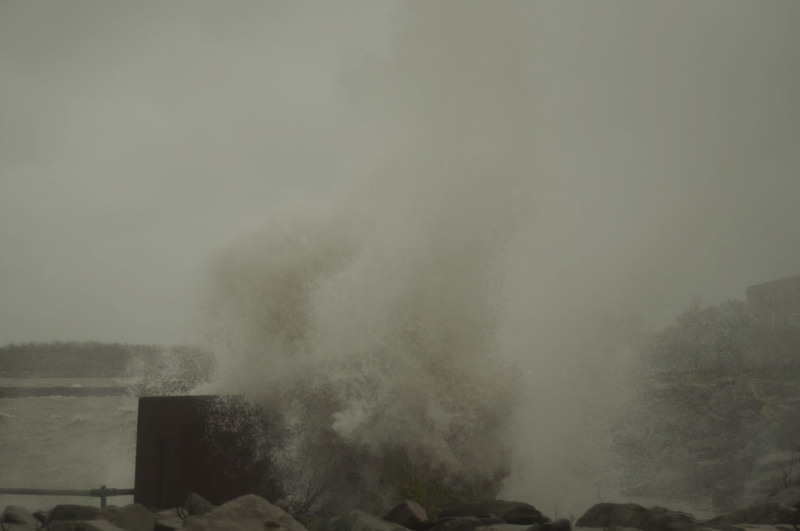 At noon today the waves were high off of Lake Erie at E. 55th St. If a line comes down on your car stay inside, roll down your window and warn others to stay away. Call authorities or ask a passerby to call authorities. The only time you should exit a vehicle with a downed line on it is if it has caught fire. If the vehicle is on fire, open the door and jump with both feet together to avoid contact with the car. It is metal and you could receive a shock. In Home Tips – unplug and avoid using major electric appliances and avoid using the telephone. You should also avoid using the telephone because in the even of a lightning strike these lines and other wires can conduct electricity. We are asking our residents and customers to follow storm protocols of seeking shelter, and to call us at 216-664-3156 to report outages. In the event of widespread outages customers will also be able to follow updates as well as report outages on Twitter, by following @cppgreen. Welcome to the second installment of Talk Back Tuesday! This week we will discuss what you should do in the event of a power outage. This is a timely subject because unfortunately, Cleveland Public Power experienced two outages this weekend, leaving thousands of our customers without service for a few hours. We apologize for this inconvenience. We have found that a blown lightning arrester was the culprit and fortunately, our crews were able to resolve the issue quickly. To put this in terms that you may better understand, an arrester is similar to your surge protector at home. So let’s say you were sitting at home this past Saturday evening, just sitting down for dinner when suddenly everything got quiet. You look around and wonder what happened and then realize the power is out. Realizing the power is out what should you do next? First, give your electric provider a call and report the outage. This is key because while our crews in the Trouble & Power Dispatch centers are aware there is a problem – they may not know how many homes or businesses have been impacted by the outage. If it is still daylight, gather candles and batteries in case of a prolonged outage. If you are using candles please remember to use them safely. This means keep them away from direct airflow, make sure they are on a heat resistant surface, keep them away from children or pets and remember to blow them out when leaving a room. When calling the provider – be patient! We know that you are anxious to return to your daily activities and we are working hard to restore your services, but many of our customers are calling at the same time which may result in a delay. Please have your address and telephone number ready. These are tools used in tracking and method to contact you if there is problem with returning your service. If you had a number of appliances running when the power went out, turn those off. This will prevent any surges once power is restored. For more information on keeping food safe during an emergency, visit the USDA site here.